A freelance project working for a emoji-based social gaming app. Think pictionary + emojis + group texting. Glyph: Where pictionary, texting and emojis meet. Glyph: a pictograph, a pictorial symbol for a word or phrase...just this time, we were using emojis. We began this project with establishing an identity before launching into the app design itself. Photography in the hero by John Khuu. When old glyphs become flat and contemporary. When designing the logo for Glyph, we looked to hieroglyphics to start. The "g" in a hand-drawn, organic cursive to nod to the free-hand nature of original glyphs. 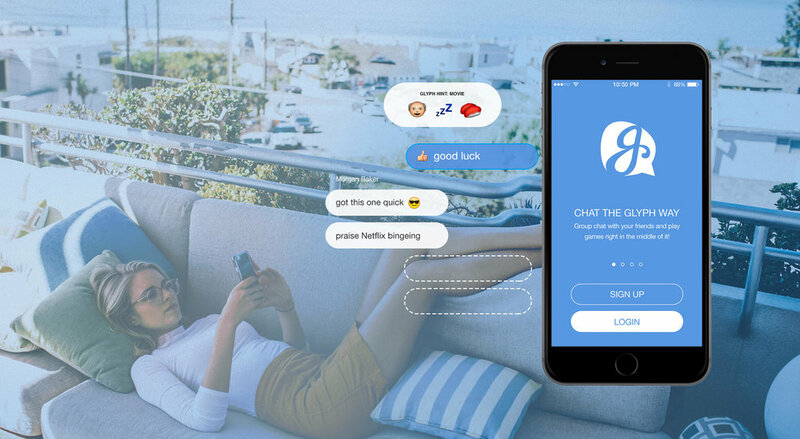 The chat bubble as a container embodied the function of the app—a conversation between friends. The slants and curves provide a playful feel which was important when designing the logo for the game app. The contemporary and cool colors were chosen to compare to other clean and flat-designed apps.